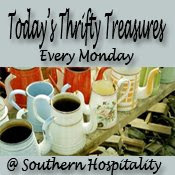 Today is Thrifty Treasures Day over at Rhoda's Southern Hospitality blog. She always has something amazing she picked up over the weekend, and today is no different. 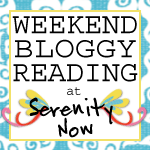 If you go check her blog out, be sure to tell her I sent you! I was crazy enough to get up earlier than usual on Saturday (after a late Friday night movie with some girlfriends) and head over to one of the local church sales that started at 8 am. 8 am is not usually a big deal...unless you also have to get two sleepy little girls out of bed, fed, and dressed before you can rush out the door. This particular church yard sale is held twice a year and normally boasts some real steals! The problem this year I think is a tie between "fame" and the economy. Now that yard sales are hot and the economy is cold and dead, everyone wanted to be at that sale! And I do mean everyone, including the enormous, angry man in the minivan who tried to steal the parking spot I'd been sitting and waiting for 5 minutes. He didn't get it. They must have opened early, because the lot was jammed, and inside the church's large fellowship hall wasn't any better. I was so proud of Natalie for staying right with me, and Michaela Byrd did a great job in the umbrella stroller as I attempted to navigate the aisles of goodies. I was a little disappointed with this Spring's selection, but there will other sales, right? So not too many treasures at this sale, but I did find a few! I rounded up a group of crotchet hoops for $1. Someone's blog (was it you, Amanda?) featured these on her site and I fell in love with the idea. Mine will be spray painted black or white and I'll "frame" some beautiful fabric in them. Wish I could claim that idea as my own. This little Southern Living at Home piece was $1. More than I'd normally pay for something that small at a yard sale, but it was a good church charity and in great condition, so I snatched it. I'm planning on using it for pens and stuff on my new desk. Natalie almost had a coronary when she saw a shelf full of Berenstain Bear books...her fave. So I let her choose some that we don't already have. They were 25 cents each. This was the icing on the cake! $4 and it had some furniture too! Natalie has the smaller house that she got for Christmas, but lately Michaela Byrd has been scaling my dining room table in a mostly futile attempt to play with her big sister. Having a second house has been nice so far because Natalie lets her little sis play with the smaller house. They'e also been good about helping me put everything back into the bins when playtime is over. But it's only been two days, so we'll see. If you have children, you know it's worth the room this thing will take up to have the kids out of your hair for twenty minutes! On the home front, I started another secret pile of toys to be donated to the Salvation Army. I hope to amass a large collection as soon as possible! Ohhhhhh...that SL vase is lovely. I was thinking it would fab on MY new desk! Great minds think alike, huh? and I wish I could take crdit for the embroidery hoop idea...but I can't. I've seen it somewhere too, but it's not mine. Wow ... would you look at those great buys for your daughter (s)! I remember when my children were young (er) and coming across such treasures! :o) Thank you for reminding me of those good memories! That is a nice idea for the fabric in the hoops! I bet that would look great!! Amanda, looks like the competition for thrifting may be heating up with the economy & our secret will be out! Oh well, I've been doing this for so many years, I don't need much now, but the thrill is still there. Great little SL vase. Funny, I don't even know what they carry anymore & have found several SL things at the yardsales & then someone tells me what it is. :) Love that! Another week of great finds! I have that exact vase and use it quite often. I think that a friend gave it to me as a gift. You are getting good at this thrifting thing. Wow! Those are some great finds!!! I love the idea of what you're going to be doing with those hoops. Who would have thought? Love it! 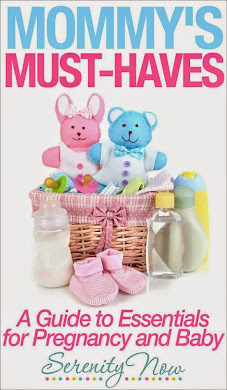 I still covet a pink and white dollhouse, but I only have boys!!! Great find on another doll house & the same color, so they'll be no fighting, right??? Is SL a coast or southern thing? I've never heard of it before...or am I just out of the loop?